The saga of my sciatic nerve pain continues! I’m going to share my experience in case someone else has this condition. I didn’t know there were so many treatment options. My pain started in December prior to major surgery and just continued to get worse during my recovery. Once my OB/Gyn surgeon cleared me for physical activity, I was sent to a spine specialist for sciatic nerve pain and a scoliosis study. She sent me to physical therapy for both conditions. PT has been great for my back but only gave me a slight improvement with the sciatic pain. After my last visit the spine specialist sent me to the U.C. Davis Pain Center in Sacramento. Yesterday I went there for a Transforminal Epidural Steriod Injection in the right Sacral-1 using Fluorscopy. I had to fast for eight hours prior to the 3:00 pm procedure. They were running behind so it actually didn’t take place until after 4:00. 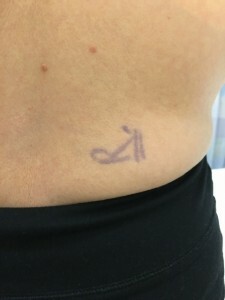 I went through a very thorough exam with two doctors to determine where the pain was originating from so they could pinpoint where the ejection should go. They both agreed with the spine specialist that it wasn’t the disc with a slight protrusion that showed up on the MRI. They agreed that it was the area under the piriformis muscle in the gluteal region of the buttocks where the sciatic nerve lies underneath. That is consistent with the fact that sitting down, driving, bending over and squatting all increase the pain. The Urodynamics testing I underwent for my pelvic prolapse surgery was the cause of the initial sciatic nerve issue. The position I was in for the nearly 7 hour surgery exacerbated the problem. Then 12 weeks of recovery with limited movement didn’t help! It just continued to get worse from there with pain shooting all the way down to my ankle. Nutmeg Notebook – The permanent maker tattoo to mark the right side of my back. 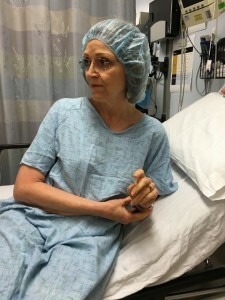 Nutmeg Notebook – Waiting for my procedure – feeling good but a little hungry. I opted not to have sedation for yesterday’s procedure as I didn’t want to be drowsy after the procedure. Although I felt calm my usually low blood pressure was slightly elevated. 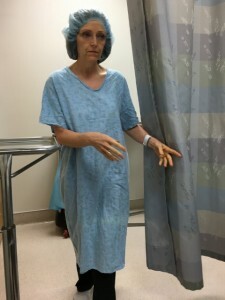 The nurse said the stress of the pain was contributing to that since I had to stop one of my pain meds a week ago in preparation for the epidural my pain level had increased. An IV was put in place in case anything went wrong. I had to be face down on the table. 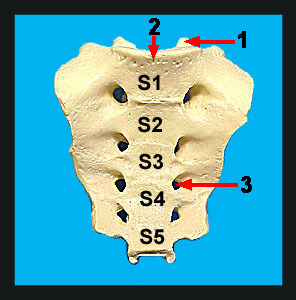 They used Fluoroscopy to locate the exact position of the sacral-1 which is a tiny hole in the sacrum. The area was numbed with a local anesthetic. At first I felt a burning sensation and that was the worse part of the procedure. When the steroid was injected I just felt pressure. The idea is that the steroid solution will bathe that area and calm the sciatic nerve down. This procedure may need to be repeated in 8 weeks and then again 8 weeks after that. It’s a waiting game now to see if it works. After the procedure they brought me my choice of juice, soda or water – I asked for water. Then the nurse brought an assortment of junk food snacks like cookies and cheese crackers – hardly whole food plant based options! But being the prepared woman I am I had healthy snacks in my purse and munched on those instead. The nurse said my snacks were a lot healthier than their offerings! Food tastes so good after fasting. They told me I had about 2 hours of being pain free from the local anesthesia so I should go enjoy a nice “sit down” dinner. So that’s what we did. It was an amazing feeling to sit down with out pain. After 6 months I had forgotten what that feels like. I miss hiking and bike riding, being able to bend over with out feeling more pain, getting up from a sitting position and not having my leg and hip seize up on me and being able to drive the car with out pain. I just want to feel good again and be pain free! I am hopeful and praying that this is going to work! Keep me in your prayers friends. Prayers are powerful. I have to thank hubby Tom for being my amazing support through all of this. He has dealt with my moodiness, tears and down days and consistently remains positive! The one thing that I can do that doesn’t cause pain is walk so I have been walking every morning 5-6 miles. It clears my head and makes me feel good when all those endorphin’s are released and it allows me to be outside which I love. 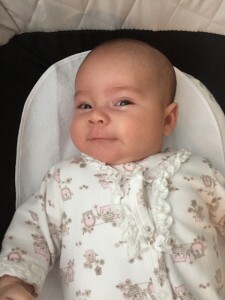 Baby Alma – I love this grin! Baby Alma is also good medicine. When I’m busy with her I forget all about my pain! Here’s to better days ahead! If you haven’t entered the Give-a-way for Chef AJ’s Epic South of the Border Cooking Webinar do it now! You have until midnight Saturday June 18th to enter. You are going to love the recipes! Feel free to leave a comment! Have you ever had sciatic pain? Previous Post: « South Of The Border Give-A-Way! Ouch!! Hope you have a speedy recovery and are back on the bike and trails soon! Sending all my plant based healing vibes your way! Thank you for the good vibes! I hope to be back on the trails before summer ends. We have had such beautiful weather this past week – it would have been a good time on the trail! So sorry you have been enduring such pain and discomfort. I have never had sciatic pain but my father does, so I know how very bad it can be. You are such a dear sweet person – so generous with your time and such an encouragement to all those in the WFPB community – and I want to tell you so. As a reminder that even when you feel “not yourself” you are still YOU – a beautiful person. Prayers for a swift and complete healing! Thank you for your kind words Teresa! You made me smile! OMG Tami! I am so sorry!!!!! So if I read this right, the first action your docs took back when made this worse!!!!??? Am I right on that? I so hope this works!!!!!! Will you take action again st the first go around docs? HUGE HUGS & thank you for sharing!!!!! 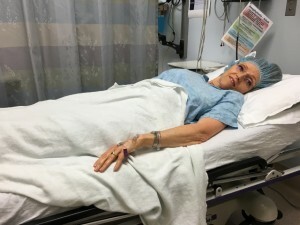 No it wasn’t the the first doctors fault at all – it was a regular test she does on women who have pelvic prolapse but because I have had sciatic nerve issues in the past it aggravated that are of my buttocks and the issue flared up again. It was just a series of unfortunate circumstances – no one is fault here. I’m so sorry you are still battling this, Tami! Glad you can maintain your good eating & walking habits. Nothing is better than family surrounding you with love. Being able to cuddle with Baby Alma is the best medicine ever! Take care. Sending good thoughts your way. Thank you for those positive thoughts and wishes Karen! I got to spend a little time Alma yesterday and it brightened my day! I’m so sorry you have been in so much pain and can’t do many of the things you love to do. I hope the procedure provides you a lot of relief and you’ll be pain free again! 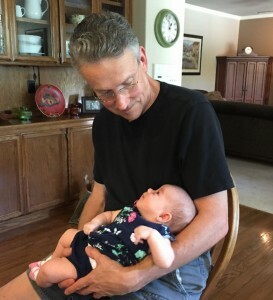 Your granddaughter is adorable, Tami! Of course she helps you forget your pain! Chronic pain is the worse thing as it really wears you down. I am so glad your back pain this time around was short lived. Enjoy your summer! I’m thinking about you and praying this is the fix! Thank you MaryEllen me too!